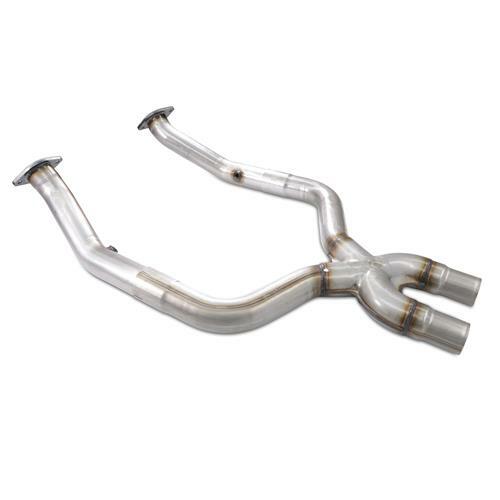 We install and dyno SVE's off-road x-pipe for the 2011-2014 5.0 Mustang! This SVE mid-pipe will feature 3" aluminized tubing, it will increase power and torque, as well as be a direct fit into your Coyote powered Mustang! Since this x-pipe does not retain the factory catalytic converters, it is intended for off road use only and WILL require a custom tune. To maximize performance gains from this x-pipe we went with a custom tune from Lund Racing. Before you begin, reach out to a friend so they can assist with the removal and installation process. Support the car via a lift or jack stands. Since you’ll be working near the starter, pop the hood and disconnect the negative battery cable. Depending on how the car is, it may help if you spray a penetrating oil on each mid-pipe to manifold retaining nut. Allow time to dwell. Either disconnect the electrical connections or loosen and remove each o2 sensor from the cat pipe. From within the engine bay, loosen and remove the outward nuts from both the passenger and driver side. Back underneath the car; loosen, but do remove the driver side inward nut. This is easily done with a 15mm ratcheting wrench and a few taps from a dead blow to knock it loose. On the passenger side inward nut, utilize the same 15mm ratcheting wrench in conjunction with a large bar or floor jack handle. Position the wrench in a way so that you can use the k-member as leverage for the large bar. Loosen, but do not fully remove the nut. Support the factory mid-pipe with a pole jack or floor jack. Loosen the two clamps that secure the cat pipes to the mid pipe. Separate the cat pipe and fully remove the nut holding it in place from the manifold. The cat pipe is now free to come out; and you can do the same for the other side. Move the jack from the mid pipe to the over axle pipes. Loosen the (4) 15mm nuts from the exhaust sleeves. Remove the mid-pipe from the car. Inspect and clean each manifold flange. Before removing each gasket, make a reference mark or mental note on their orientation. Not that they are side or direction specific, it seems like reinstalling them in the same manner is easy on the mind if you know what I mean. Apply anti-seize to all (4) of the provided bolts. On the passenger side, pass (2) of the provided bolts through the top-side of the manifold with the threaded ends facing towards you. Install the gasket over the bolts. Position the correct cat delete pipe into place and install (2) nuts. You’ll know right away if you have the correct side or not. Remember, the o2 bungs will face towards the transmission. Help from a friend will be beneficial for this step. Run these down until there is just enough movement to adjust the pipe. Do the same for the other cat delete pipe. The black line you see on the cat delete pipe is for the mid-pipe and how far it needs to slide over the each cat delete pipe. This was done off-camera. Slide the (2) provided band clamps over each cat-delete pipe. Before installing the x-pipe, verify that you know the correct orientation. This is easily done by measuring the length of each leg on the x-pipe. The passenger side has the longer leg. If needed, lower the over-axle pipes enough to install the x-pipe over the cat-delete pipes. Align each over-axle pipe with the mid-pipe and position the clamps. Before tightening the nuts, jack up on the over-axle pipes just enough to get them even with the x-pipe. Tighten the (4) 15mm nuts. Position each band clamp and fully tighten the 15mm nuts. These nuts torque to approximately 80 lb-ft.
Now you can fully tighten the (4) 14mm serrated locking nuts. Because of their design, you may or may not have to hold the 14mm head on the bolts. Now would be a good time to verify tip alignment. Apply anti-seize to the threads on each o2 sensor. If you removed your o2 sensors without disconnecting them, twist them counter-clockwise a few turns before reinstalling. Reinstall each o2 sensor and tighten them down. Now you can go ahead and flash the PCM with the updated tune. It’s always good to return to stock first and then upload the new tune. Depending on battery age, hooking up a battery tender may be needed. Once the tune loaded, start the car and check for exhaust leaks. After that you’re good to go! Eliminate your catalytic converters for increased exhaust flow and performance with SVE's new and improved off-road X-pipe for the 2011-2014 Mustang 5.0! SVE completely redesigned this X-pipe to provide better fitment as well as utilize high-quality materials for long-lasting performance. The off-road design will remove your restrictive catalytic converters which results in an intimidating exhaust note and newfound power. SVE dyno tested this X-pipe after installation which resulted in a gain of 17 horsepower and 13 foot-pounds of torque when combined with a tune (individual results may vary)! SVE's new and improved X-pipe has been meticulously designed to provide you the best fit and finish on the market. Featuring 3" mandrel bent tubing, you'll experience a free-flowing exhaust that tucks up nicely beside your frame rails. 409 stainless steel material is utilized to provide long-lasting performance and corrosion protection for years to come. Each rear oxygen sensor bung is accurately placed on the cat-delete pipes so no extensions are required. The 3-piece design requires no cutting and bolts in place for a quick and easy installation with the included hardware. A custom tune is required for this x-pipe. This product is intended for off-road use only, and is not legal for use in emission restrictive states.